I got into the early beta for Pottermore this morning and I've spent a lot of time messing around with it. It's immersive and fun and I've spent way too much time there. You can read my full thoughts about the experience itself on Huffington Post or Big Shiny Robot! But there's something else about it that excites me as an author: I'm not even the biggest Harry Potter fan, but sitting there trolling through all the behind the scenes content of the books, I was dying to get the digital versions to make it easier to follow along with the experience. That's their next big step, launching the eBooks. I've already bought copies of all the books, but something about the experience of Pottermore made me desire the digital versions. Imagine that happening to the millions expected to be using this free service and want to buy an eReader to buy the digital versions of the books proper? These readers aren't going to be buying just seven books. They're going to be starving for all kinds of content. And we're going to be the ones filling in the gaps to give it to them. J.K. Rowling, whether she knows it or not, is helping us widen our audience exponentially, and that's good news for everyone. 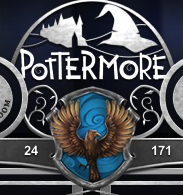 And if you're interested in dueling me in Pottermore, feel free to add me. My Pottermore username is Lightnight 111. I won't be on much now that I've already been through the first book since I have so much writing to do, but when they add subsequent books I can see myself easily wasting days on it. Pretty sweet dude. I signed up for Pottermore but haven't got the owl for it yet.